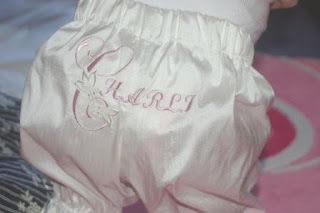 Charli's mum asked me to make a pair of matching soft off white silk christening pants to go with the" LUCY"christening gown.You can view the gown on my website . I just fell in love with the final product, don't you agree they are smashing !!! In order to get the name embroidered with the shades of pink silk thread across the back of the pants I had to stitch up the silk back panels together than work out the exact positioning for the name and not forgetting to allow the extra length for the elastic. It was exciting though ! This was the first time I have been asked to embroider a "bottom" !!! What a great idea , don't you agree ??? The baptismal pants are complemented with a couple of double sided satin ribbons gently stitched on the sides of the leg cuffs. Hi there! Thank you so much for the visit. MY Andre had a linen outfit for his Christening. It was made by an Indian so the top was decorated with threads of gold. Back then, the weather was still bearable so babies can wear anything. It is July and August that is warmest. Your Christening gowns are beautiful!